Participating in trade shows and conferences is an important—if sometimes overrated—component of an effective marketing strategy. I say “overrated” because many firms get enthused by how many contacts they make while failing to really evaluate the results (which are often meager). Define your purpose. Many folks assume the reason for exhibiting is obvious—generate new leads. But there is much more potentially at play: Strengthening existing client relationships, learning about emerging client needs and trends, helping clients (more on this below), branding your firm. And don’t overlook the opportunity to recruit. For the larger, more general trade shows where all your competitors are present, I think a recruiting focus is a great way to differentiate your firm (plus there’s a big pool of potential employees there). Bottom line: Make sure everyone who works the booth knows what they’re there for. Clarify your message. I used to inconspicuously hang around competitor booths to listen to how they presented their firm. There was a consistent trend. When someone asked, “So what does your firm do?” the standard answer was, “Oh, about everything” or some other variant of "we're a full-service firm." Ugh! Claiming to do everything says nothing. Now most of these firms had distinctive messages on their booths or in their literature, and sometimes it was pretty good. But the people working the booth were poorly prepared to describe what their firm was all about. I recommend coaching everyone on how to present the firm in those first few seconds. The message should be relatively consistent. Better still; quickly shift the focus to the prospective client. I hate sales pitching in general and find it particularly aggravating at trade shows. I suspect clients feel the same way. Trade shows seem to give some license to pitch to the max, and the faster the better. Once the folks in the booth have provided a very brief, distinctive introduction to your firm, they should turn attention to the client: “So what kind of challenges is your company facing?” Or something like that. Encourage the self-discovery approach. One of the best ways to get your folks to think more strategically about their approach in the booth is to ask them to wander around to the other booths to listen and observe. What approaches do they like? What don’t they like? Chances are they’ll see a little of themselves out there and they’ll better understand what needs to change and how to do it better. Qualify leads. You don’t need to go to the expense of a trade show just to produce a list of prospects to call. Google is a cheaper alternative. With the opportunity to talk face-to-face with prospective clients, your firm’s representatives should be urged to determine who warrants follow-up. Even better, have the prospect expecting (hopefully, even looking forward to) a follow-up call or visit. Reps who might be doing such follow-up should have their calendars available to schedule calls or meetings, if possible. As a general rule, don’t exhibit unless you’re speaking. Most people attend for the sessions, not the exhibits. But a booth provides a great forum for follow-up to a presentation or other visible role in the conference. Unless your firm has that visibility, I question the value of paying for exhibit space. Keep in mind that some people attending a trade show can meet just about as many people without a booth, and it’s a lot cheaper (usually). Again, I used to hang around my competitors’ exhibits to figure out who I should be talking to. Assign the right people. 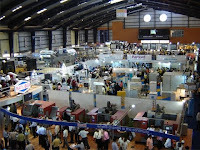 A common mistake is to use trade show exhibits as a training ground for younger technical staff or to assign marketing personnel who don’t know how to engage a client in meaningful conversation. If there’s good reason to include such folks, make sure they’re teamed with more experienced, qualified individuals. Showcase something that stands out. I’m amused how often firms rely on giveaways and other gimmicks to drive traffic to their booth. Why not have something distinctive to say? I know, easier said than done. Yet perhaps no other forum—where you’re surrounded by your competitors—better points out the need to differentiate your company. But that’s a topic for another post! A very enjoyable read. You really get trade shows, both the opportunities and the pitfalls. You say many firms focus on the contacts they make rather than the results. To create better results, A/E firms not only need to follow your excellent advice, but also put as much effort into following up on the leads as they did in their efforts to generate them.